Step 1. Tap “Settings” app from your home screen. Tap “General” and scroll down to find the “Auto-Lock” feature. Tap it to access Auto-Lock menu. Step 2. 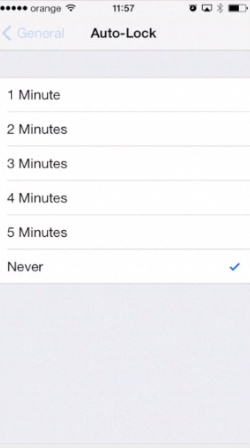 To enable Auto-Lock, we should choose one of presets with “minutes”. If we need to be careful with our battery, we can tap to choose “1 Minute”. Thus, when we use our iPhone actively and touch its screen at least once per minute, Auto-Lock will be off, but, when we put it in a pocket, lock screen will be on in a minute. 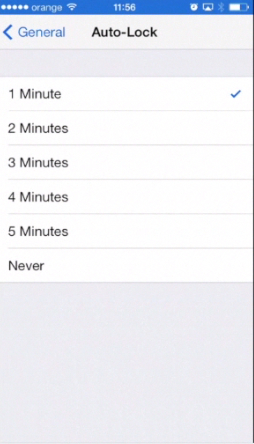 If you need your screen to stay active for 3-5 minutes before touching it again, let’s say, you’re using your iPhone as a timer while doing your home exercise, you can set it to “4 Minutes” or “5 Minutes”. Our favorite setting is somewhere in between. Let’s say, “2 Minutes”. Step 3. After you’re done with setting Auto-Lock, simply tap “General”, then “Settings” and the Home button to return to your home screen. Step 4. After two minutes of inactivity, the screen switches off. Press the Home button and slide the screen to return to operating mode. Step 5. There are times when you need your iPhone screen to stay on for more that 5 minutes. For instance, when you’re watching a film on iPhone’s screen. To avoid “blackouts”, you might want to temporary switch Auto-Lock off. 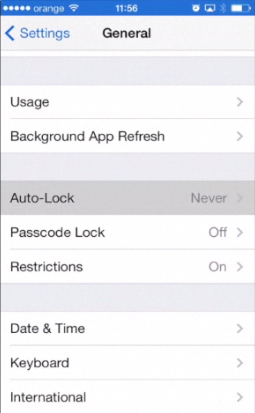 Simply access Auto-Lock feature through the “General” app again and set it to Neverland. Result: Great! Now you know how to enable and disable Auto-Lock and when to do it!